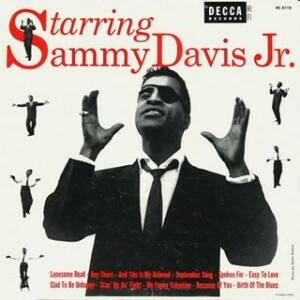 Sammy Davis, Jr. - Starring Sammy Davis, Jr. 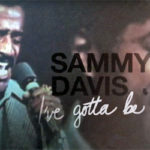 Starring Sammy Davis, Jr. was Sammy’s first album and provides an interesting mix of curiosity numbers approximating his nightclub act, swinging standards, ballads, and heavily orchestrated show tunes. When Billboard announced Davis’s signing for Decca Records in June 1954, it said “Decca plans to put his own style on record” – as opposed to treating him like a nightclub performer novelty signing. 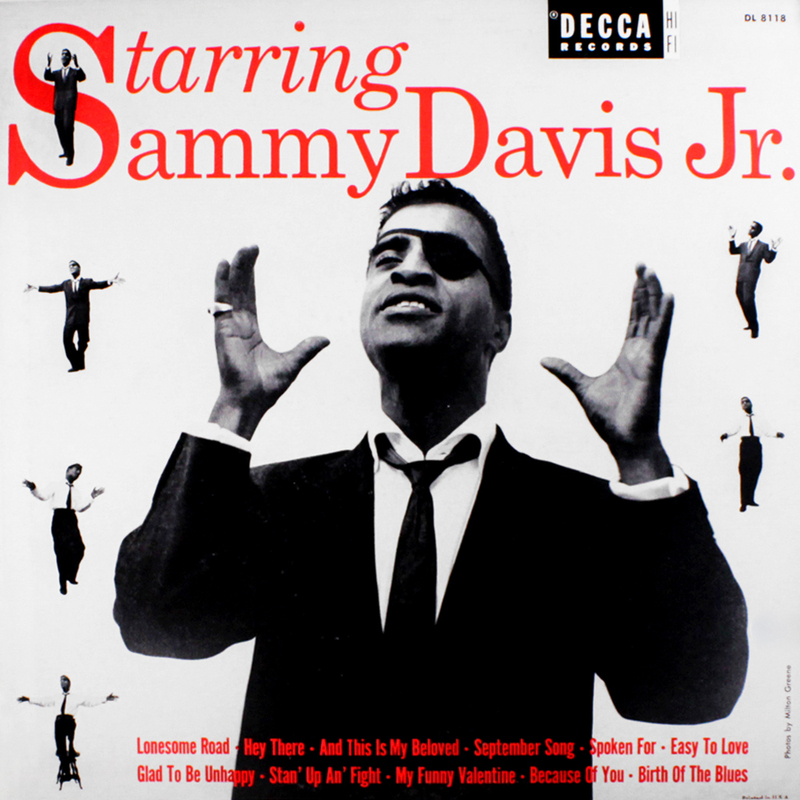 Despite this intention, Decca’s first Davis album features “Because of You”, with Sammy doing his stable of impressions of singers (Nat Cole, Tony Bennett, Mel Tormé, Billy Eckstine, Vaughan Monroe, Frankie Laine, etc) and actors (James Cagney, Jimmy Stewart, Cary Grant, Lionel Barrymore, Edward G. Robinson, Jerry Lewis, etc), and “Birth of the Blues” with canned applause designed to give the impression of a live performance. Beyond these two cuts, though, Sammy displays some indication that he has more command of his craft than 5 years previously (when he recorded some singles for Capitol), and also some indication that he has a way to go to find a sound truly his own. “And This Is My Beloved” from the musical Kismet was intended to be the big hit from his first session (and in 1958 Sammy would say the number was a particular family favourite), but it was the popular tune from The Pajama Game “Hey There” which charted well as a single instead, arriving on the charts in August. It reached #1 on the Cashbox charts, #16 on the Billboard charts, and became a signature tune for Sammy. The car accident in which Davis lost an eye in November 1954 was not only a devastating blow physically, but potentially also to his confidence and his career. But, instead, Sammy’s legendary comeback at Ciro’s on 11th January 1955 saw him ride a wave of publicity. Decca quickly had another four sides recorded on 26th January, and released the completed LP on 18th April, with Sammy wearing his now-iconic eye patch on the front cover. By 11th June, it was the #1 album on the Billboard charts, and stayed there for 6 weeks. It would be Sammy’s only #1 album on the Billboard charts. Birth of the Blues: Davis recorded this song, a staple of his live act, three times in the studio through his career, and this is the best by far. Despite the mildly distracting canned applause, Sammy gives this one his all! Hey There: Sammy’s first signature tune! 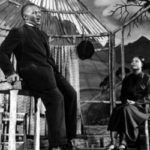 Spoken For: Davis became great friends with Mickey Rooney, who wrote this song, following their days together on a tour of the RKO cinema circuit in 1946. Not surprisingly, Sammy chose to record one of his songs in his debut album. September Song: Sy Oliver, the arranger, gives this standard a late-night vibe, and features legendary tenor saxophonist Sam ‘The Man’ Taylor heavily. This received a direct reissue in 2007, from Collector’s Choice. Several tracks from it had appeared on various compilation CDs up until that point. It can currently be purchased digitally at both iTunes and Amazon. 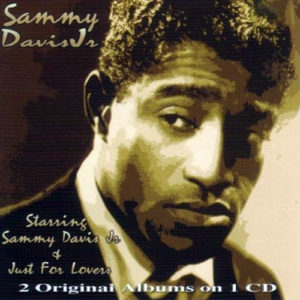 Beware of the Hallmark 2007 release, an unlicensed European CD which purports to contain Starring Sammy Davis, Jr. and Sammy’s next Decca release, Just For Lovers. However, it inexplicably omits “Easy To Love”, and “Stan’ Up An’ Fight”, from this album, replacing them with “The Red Grapes” and “Love (Your Magic Spell Is Everywhere)”. 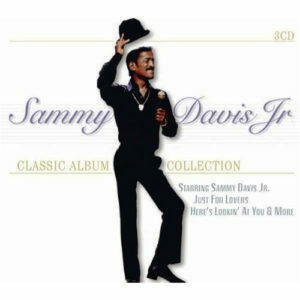 2007 Starring Sammy Davis, Jr.
Official reissue. Excellent liner notes from James Ritz. Beware – phoney unlicensed collection with incorrect tracks included.